In the last installment, we looked at Dr. Wilkison’s two J-135’s. What did not show up on his inventory listing, but which has been attributed to him, is a blank planchet for an annular gold coin of the weight of .965 grains (or 14.89 grains). 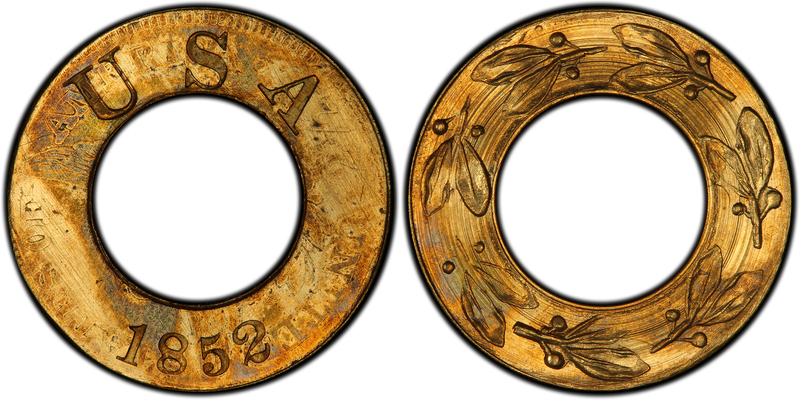 This weight conforms closely to some of the known J-135 Half Dollar patterns, but it is too light to be a J-136, J-137, J-169, or J-145 (the other annular gold patterns. The pedigree on this mysterious coin is shown under Pollock-162 (his Item D, expanded here) as: Dr. John E. Wilkison (per Pollock) – D.M.X. Fretwell Estate (d) – Robert L. Hughes 3/1981:1059 (d) – Superior 10/1991:2226 (as Raw MS65), $2,530. Now, on to more of Dr. Wilkison’s gold Dollar patterns. Judd 137 was another attempt in 1852 at an annular Gold Dollar — or was it? Two examples have survived, both struck over Quarter Eagles, one of which was dated 1859! Clearly, Judd 137’s were struck as rarities for sale to collectors. One example was owned by Dr. Wilkison; both nowreside in the Simpson Collection (as of this writing). There is some confusion regarding the early pedigrees of both pieces, but there is no doubt that the piece illustrated here is the one owned by Dr. Wilkison. It is the plate coin in Aker’s Gold Pattern reference, where he claimed that it was struck over an 1846 Quarter Eagle. However, I examined this piece in person in 2000 and could find no evidence of the date, which is obliterated by an unfortunately placed leaf. Nor is the date visible on Phil Arnold’s recent, high-resolution image here. Judd 141 is a “common” variety relative to the other gold patterns. Pattern researcher, Saul Teichman, estimates that perhaps a dozen are known. Dr. Wilkison owned two examples, but only one can be positively traced to his collection. Like many of Dr. Wilkison’s gold patterns, this one is now part of the Simpson Collection.